The core notion, if you are to understand decision-making in an economic setting, is to recognise that every decision will entail costs. Since the aim in commencing commercial activity is to generate a profitable outcome, for that to happen the amount of money brought in must exceed the amount of money paid out. Not instantaneously, of course, but over time. Because what is especially important to understand is that, almost invariably, the costs will need to be met before any money at all is earned, and for a period of time costs will be in excess of revenues. 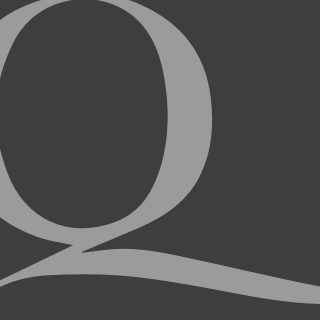 And the final element to understand is that at the time the decision is made, every part of the project is merely a set of expectations with varying degrees of certainty about what the eventual outcome might actually be. The marginal revenue is the addition to revenue this new venture is expected to earn. The marginal cost is the addition to costs that will have to be paid out in running this venture. And the likelihood of such additions to revenues and costs is judged not after the results are in, but at the moment when its future prospects are being considered before anything concrete is known. 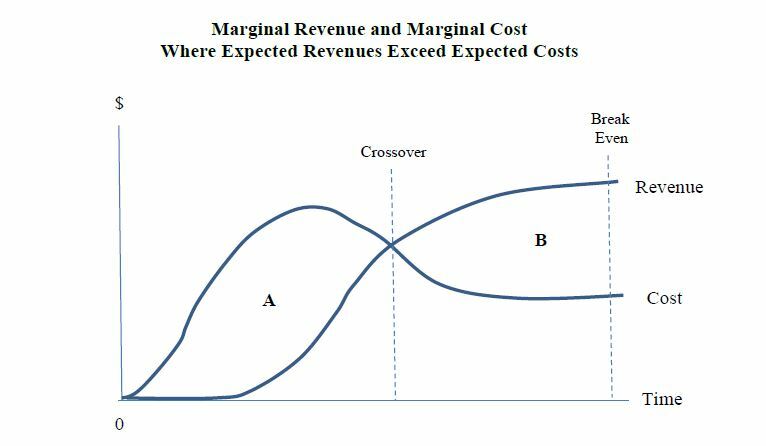 The diagram below provides the proper means to understand the nature of marginal revenue and marginal cost. The horizontal axis shows the time frame over which the costs and revenues are being calculated, starting from the present moment, which is the moment the decision is being made, which for every decision is the immediate present. The vertical axis shows the expected amount of money to be received or spent at each moment in time. At the moment the decision is made, all past costs are past. The only issue is what is expected to occur in the future, which is why both the revenue and cost lines at the origin at the far left of the diagram. There may well have been an immense series of payments that led up to that moment, but all that is past. Now we are looking forward and considering what will happen from this point on. The Revenue Curve shows a stylised estimate of the revenue that is expected to be earned during each time periods as a result of this decision. Since in each time period there is an amount of revenue being earned, the total revenue earned is shown by the area under the Revenue Curve. As with virtually all projects, no revenue is earned until some stage in the future which is why the curve runs along the horizontal axis for a period of time. The marginal revenue is thus the total additional revenue expected at the moment the decision is being made as a result of this decision having been made. Costs begin to accumulate almost immediately as shown by the costs line. This too is a stylised representation since costs will typically be intermittent, in some periods higher and in some lower. The cost curve, however, shows a smoothly continuous increase in costs starting from the vertical axis, rising for a period of time as the initial start-up costs are met, and then coming down to settle in at some level which are essentially the running costs of the venture. The area under the costs curve represents the total expected costs of the project. These are merely expectations but the aim is eventually to reach a position where the addition to revenue exceeds the addition to costs. Importantly, it should be understood that this position does not occur where the two lines cross. In any successful project, at some stage the two lines must cross to allow revenue to become greater than costs. At that moment, the project has begun to pay its own way, meeting all of its expenses out of revenue. But it has not yet repaid all of the costs that had allowed the project to get under way. The funding for the project has come out of the accumulated savings of the community. Whether it was the raw materials used in construction, the capital equipment that has been put to use, or the wages paid to employees, all of that can only have come out of accumulated savings. And do note that these are not savings in the form of money and credit but savings in the form of actual products and services. Wage earners will, for example, use their wages to buy goods and services. Unless prior saving has occurred, these purchases cannot occur. The venture will only have finally covered its cost when the area B, which is the revenue over costs past that breakeven point, is finally equal to Area A, which are the costs in excess of revenue that will have been borne before the project began to earn a positive return. At that moment but not before, the expected revenue is exactly equal to the expected costs. Only thereafter will the project show a positive return. But what cannot be emphasised enough is this. The revenue and cost line are projections. They are estimates of what might happen. And in any conjectures such as this, there are almost always alternative possibilities that fail to show a profitable outcome. It is just as possible that in looking into the future, there is also a loss-making outcome that is thought of as a realistic possibility, as shown in the diagram below. Here the costs are the same but the revenue projections never rise above the costs. 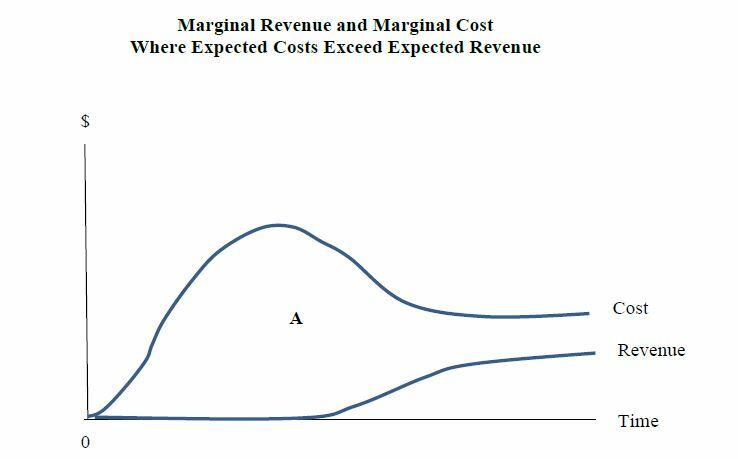 This is a project for which the expected addition to costs, the marginal cost, is greater than the expected addition to revenue, the marginal revenue. This is a venture that would never be undertaken since marginal costs are well above marginal revenue. The message of the diagram is broader than just economic decision making. It shows how actual decisions in every part of life are determined, from personal decisions through political calculation and onto every important commercial consideration. Every decision is based on some weighting of the expected benefits against expected costs, looking from the present and into that unknowable future. As solid as the lines may appear on the page, they are curves of conjecture, mere thoughts in someone’s head about how things might turn out if some particular action were actually taken. Finally, even if there is a positive expectation, there is no certainty an actual decision to go ahead will be made. There may be a range of projects that are being considered with further judgments required to pick and choose amongst them. The risks may just be too great relative to the expected return. The best alternative use of these resources is the opportunity cost, what is not undertaken so that this project can be. But merely because marginal revenues are greater than marginal cost is not enough to ensure a project will be undertaken. Steve Kates is Associate Professor of Economics at RMIT University.